Deciding to try the first UK release of the Jo Nesbo novel “The Snowman” upon the enthusiastic recommendation of Richard Madeley and Judy Finnigan, I became fascinated by the graphics and copy of the book Jacket. A large circular sticker (which is not actually a sticker at all) proudly claims “The next Stieg Larsson – Independent”. I immediately thought of the gag “the next but one Stieg Larsson” as though there is a polite queue of authors all aspiring to the late author’s throne. I’ve thought I could use this gag in a painting, but the fascination runs deeper than this group of words. The reference to “Independent” is also mildly puzzling as the UK newspaper I assume this refers to would surely be “The Independent”. The female depicted on the cover looks somewhat shocked in the direction of the sticker. Would the author agree with her that his serious work he has strained hard to achieve, should not proclaim itself to be a bit derivative of somebody else’s work. I guess this is all marketing hype and as it is not his home country he may not be too concerned. I can’t quite imagine a painting have a “sticker” on the frame proclaiming “The next John Constable”. 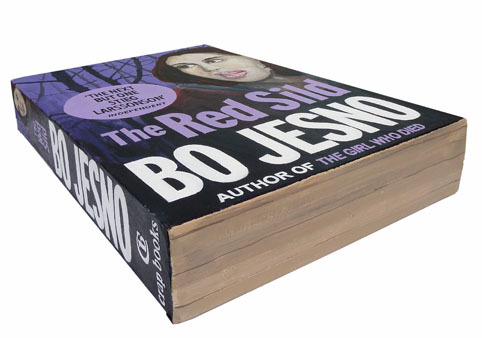 Perhaps a book cover has to describe its wears more than a frame, but once in a personal library, the book cover can be a part of the artistic experience. So it is a shame to be left with the marketing hyperbole. With this in mind I create my own book in the series based on several of the covers but with its own colour-way. The names were slightly changed to protect the innocent. I wanted the painting to be scaled up from the size of the book so that the typography would be manageable, and the piece further abstracted from the original. I tried out various titles including “The Evil Sparrow” which seemed to fit in with the book’s style of titles and the strap line “Author of Murder in the Gloom”. 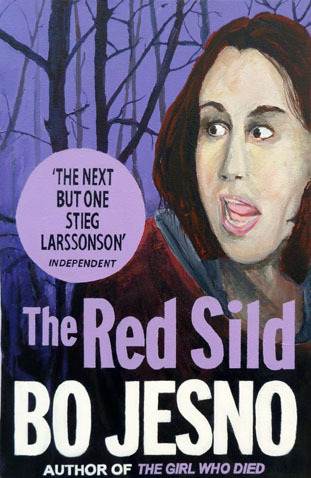 Of course one could carry on forever thinking up titles, but I settled on “The Red Sild” as it was not laugh out loud funny, but Sild is Norwegian for Herring of course. To create the image I did extensive computer preparation. I scanned in the book covers, so that I could get correct positioning and also recreate the typeface in adobe illustrator. I also used a photo of my wife making faces and a holiday shot of trees by a lake. On final painting I drew these back toward the book covers with the eyes of the lady and the foggy forest. The canvas was created by using two canvases, canvas removed, and frames cut down to the appropriate size with the frames attached to each other to create the appropriate book thickness and the canvas reattached. Pleased with the result, hope you like it too.